Over the last 20+ years Ken has been teaching others these simple techniques so they can create the life that they desire. Do you long for more? What would you wish for if you had the chance? You will soon learn how to create the desires of a lifetime while overcoming the worries and blocks that impede your happiness. You will fully understand how to use thought as a simple and powerful tool. No more wishing and hoping for results, you are the genie! This is the breakthrough book that describes for the first time how your thoughts create anything. Finally, indispensable knowledge that explains the act of creation itself. Available on Amazon, at www.Manifesting123.com and at some metaphysical book stores. Feel free to post your personal questions (or private message us) on the INSPIRED LIVING RADIO (ILR) FACEBOOK OR TWITTER accounts (@inspired4us), and we will bring them live to air! 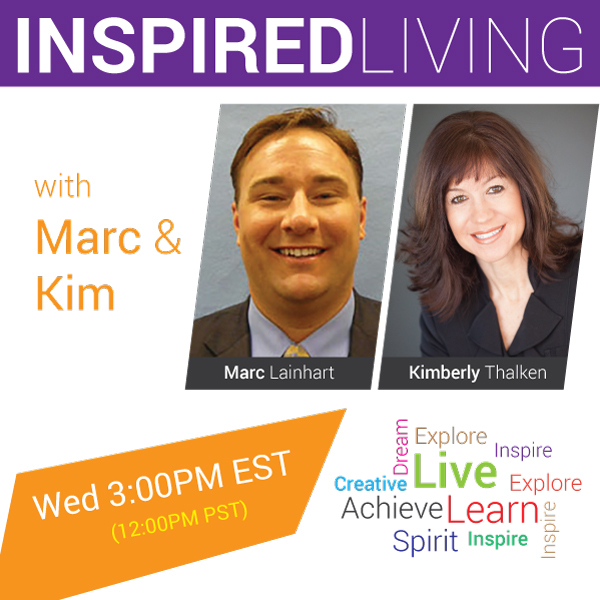 This is a great way to interact with the LIVE show, Marc & Kim, along with celebrity guests!